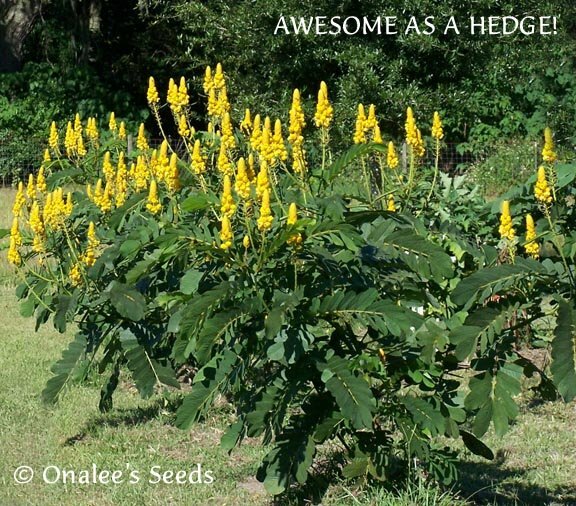 12+ CASSIA ALATA / CANDLESTICK / CANDELABRA BUSH SEEDS PLUS planting instructions. 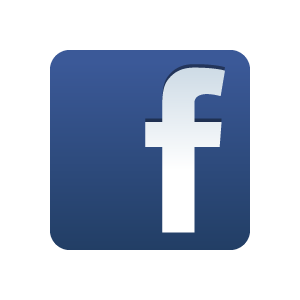 (Larger Quantities Available, see drop down box). 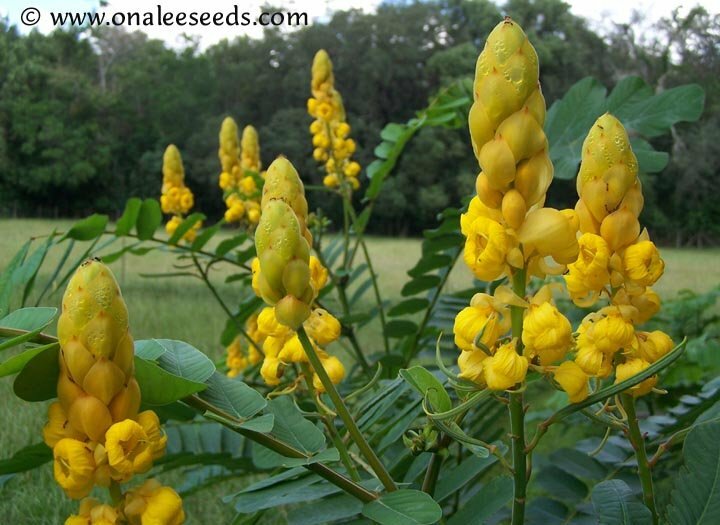 This plant is also known as: Candle Bush, Empress Candle Plant, Candletree, Candelabra Bush, Ringworm Tree (Senna alata). Plants have handsome foliage and grow rapidly in full sun on a wide range of soils, and may reach a height of 10 feet with an equal spread (most I grew were about 6" high and wide). It is a tropical plant and can only be grown outside year round in the warmer zones of 9 - 11, where they become huge specimens. In colder zones they are best treated as an annual. They grow easily from seed, and mature quickly and they flower in the late summer, early fall of their first year with the MOST AWESOME DISPLAY OF FALL COLOR YOU'LL EVER WANT TO SEE! Large, bright yellow flowers resembling (surprise!) Candelabra's persist from late summer to frost - you really have to see these to believe how beautiful they are! Grow as a specimen plant or as a HEDGE that will draw the attention of everyone that passes! Even before these plants dazzle you with their blooms, you'll be amazed at their leaves (which are easily the size of a man's hand!) which fold up at night like a prayer plant! This is really cool to watch in the evenings! Pinching new growth increases branching, creating a fuller canopy which produces more flowers. These plants are best IGNORED RATHER THAN PAMPERED for the MOST BLOOMS! Do not provide supplemental water or fertilizer after they are established in your garden except in EXTREME drought conditions. Cassia's are host plants for the yellow sulphur butterfy caterpillars, it's a must-have in your butterfly garden! Leaves or sap are used to treat fungal infections such as ringworm. They contain a fungicide, chrysophanic acid. Because of its anti-fungal properties, it is a common ingredient in soaps, shampoos and lotions in the Philippines. 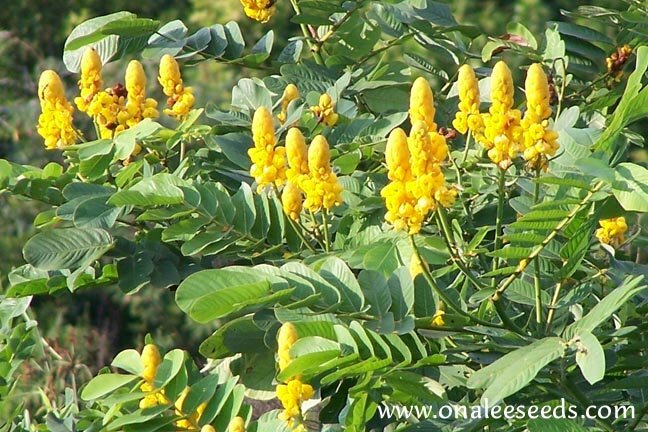 The effectiveness of this plant against skin diseases is confirmed by modern scientific studies. In Africa the boiled leaves are used to treat high-blood pressure. In South America, besides skin diseases, it is also used to treat a wide range of ailments from stomach problems, fever, asthma to snake bite! Candleabra bushes make a wonderful addition to any garden! Larger quantities available below - see drop down box.